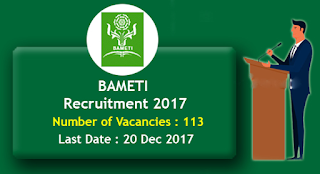 BAMETI Recruitment 2017 For 113 Agri Business Facilitators & More. For Agri Business Facilitator : Candidates should have passed B.Sc. Agriculture/Horticulture from a recognised university. For Accountant : Candidates should have passed Graduation Degree with Commerce and must have knowledge of Computers/Tally and functional knowledge of English. Selection of candidates will be made on the basis of Merit and Personal Interview. Interested and eligible candidates may apply online through BAMETI website - http://krishi.bih.nic.in/ - from 27-11-2017 to 20-12-2017.